I’ve recently had the opportunity to work on a data-intensive project for a client using the jqPlot library. jqPlot is a jQuery library that lets you easily render almost any kind of graph you can imagine. I’ve included a screen shot of two of the graphs I worked on, but you can see just how versatile jqPlot is by checking out these examples. 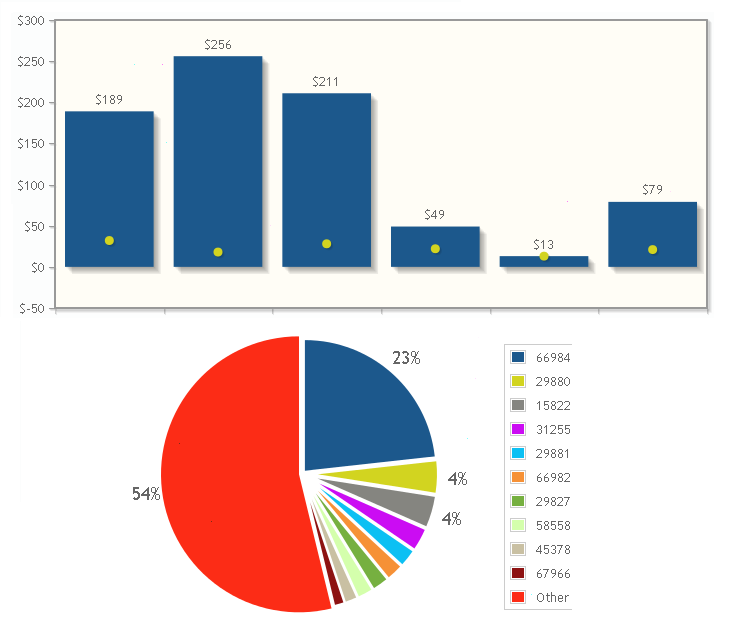 But the client also wanted to show the total for the stacked values above each bar, and jqPlot can’t accommodate that. With the help of Firebug (thank you Mozilla! ), I was able to find the classes that jqPlot was using to draw the graphs. So I knew I could insert a div based on that information. But where to insert it? Since the values of the stacked bars can vary (greatly, in some cases), I really didn’t know how to adjust the height of each div on the fly. But (and pay attention, kids!) I realized that math could solve my problem.